German medium anti-aircraft gun Flak 18, 36 and 37. 88 mm Flak ready for firing during Operation Battleaxe (North Africa, Juni 1941). More than sixty Matilda tanks were destroyed by this guns during this battle. 88mm gun Flak 18, 36 and 37. Type: medium anti-aircraft gun, but often used as anti-tank or field gun. The terms of the 1919 Versaille treaty set rigid regulations about what artillery manufacturing might be accomplished in Germany, therefore the biggest German armaments firm, Krupp of Essen, dispatched a group to Sweden to continue development and research away from enforced limitations. Dealing with Bofors AA guns the Krupps crew worked in the beginning on a 75-mm (2.95-in) anti-aircraft weapon making use of hidden German military finances, however the Wehrmacht wasn’t especially pleased with the outcome and requested something heavier. The ‘Swedish’ Krupp team consequently created a brand new and superior 88-mm (3.465-in) gun that by 1933 was at series production at Essen as the Nazis came to power. This new gun was the 8.8-cm Flak 18 (Flak standing for Fliegerabwehrkanone, or anti-aircraft gun), and it was an instantaneous success. It was a long-barreled gun mounted on a pivoted cruciform carriage which was therefore carried on the move by dual axles that permitted the weapon to be quickly put into the firing position. The Flak 18 were built with a one-piece gun barrel but was later supplemented by a better model, the 88mm Flak 36, which had a multi-section gun barrel on which just the worn part closest the chamber must be replaced after extensive shooting. Then arrived the 88mm Flak 37, which was a Flak 36 having a modified system of fire-control information transmission more fitted to stationary use than field use. In reality the 3 versions were exchangeable to a large degree, and it wasn’t uncommon to find out a Flak 18 barrel on a Flak 37 carriage. Numerous modifications had been introduced to the guns after they were operating, along with a modified twin-axle carriage design, and the 88mm Flak line was modified to be persisted a number of self-propelled mountings, together with railway flat cars. German 88 mm Flak 36 in North Africa at the moment of firing, still on the carriage. Reloading a Eight-Eight in North Africa. A 88 gun of the Luftwaffe fires on Soviet positions during the German summer offensive of 1942 in southern Russia. 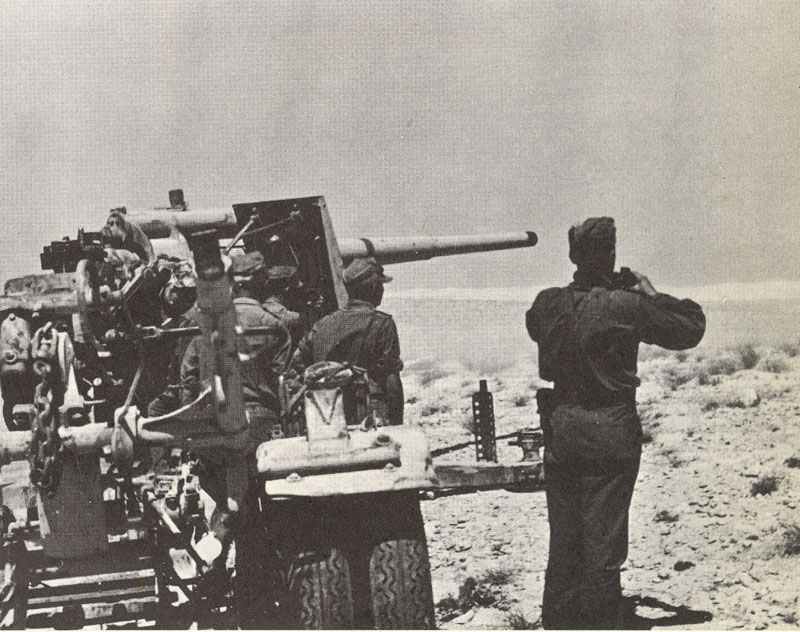 A 88 gun of the Luftwaffe is getting into position in Tunisia. Knocked out Eight-Eight gun in Tunesia 1943. 88 guns during the heavy fighting at Salerno, Southern Italy. 44 rings on this barrel denote the number of ‘tank kills’. The 88 mm Flak 37 in an emplacement for medium anti-aircraft guns in Germany. 3D model of 88 mm Flak 36. The 88mm Flak series became one of the most famous weapons in the entire Wehrmacht, for it continued to be as popular as an anti-tank gun as it was as an anti-aircraft weapon: after the gun’s ‘blooding’ in Spain during the Civil War and once more in France in 1940, it was found out that the high muzzle velocity in addition to an effective and heavy projectile created the gun perfect as a ‘tank killer’. This became very evident at the time of the first North African battles against British Matilda tanks and later on Russian Front campaigns against Russian T-34 and KV-1 , however the 88mm Flak series was actually exorbitant and ponderous for the anti-tank role and had to depend on its fire range and hitting power instead of concealment in action. As anti-aircraft weapons the 88mm Flak line was the anchor of the German field armies and of the defence of the Reich under Luftwaffe control. The type never was replaced by later versions as had been intended, and in August 1944 there have been 10,704 of all 3 versions operating. Manufacturing was carried out at a number of centres, and a wide variety of ammunition was manufactured for these weaponry, along with a large percentage of armour-piercing. By the end of the WW2 models for stationary emplacement just were being manufactured, but at that time the 88 gun series had been utilized on self-propelled vehicles, railway mountings, coastal defence places, light shipping and in a number of trial varieties. The 88 guns had been also used by the Italian army, as well as for some time at the end of 1944 the weapon was even used operationally by the US Army along the German borders when its own supply lines became overextended. Numerous were used by a number of armies post-war, as well as the Yugoslav army employed the Eighty-eight gun as a coastal gun before the Civil war. Practical rate of fire 15 rounds / min. 88 mm gun Flak 36 firing. Tagged 1939, aa-gun, at-gun, germany.